One of the key characteristics of modern society is the search for happiness through increasing consumption, which is fueled by technological innovation.Success in the modern day is defined by worldly recognition and status. Despite being a natural part of life, death is largely ignored and avoided as a topic. Life has become increasingly segmented and distressful. Happiness becomes increasingly hedonistic and consumption-based. At the same time, the world is still facing sickness and death as always, leading to social and public health problems that can be easily observed in the intensive care units of any hospital. Thai society today has a negative attitude towards death, associating it with fear, sorrow, loss and inauspiciousness. Consequently, we miss the opportunity to seek wisdom and growth through the understanding of death and dying. We lack adequate inquiry and conversation on living and dying, causing carelessness in times of good health and low quality of life especially when sick. For these reasons, discussing and understanding death on a societal scale is imperative and should be consistently supported in all social circles. Sogyal Rinpoche, a Tibetan lama, is one of the sages that has shared his wisdom on death and dying through his interpretation of The Tibetan Book of The Dead, which has been produced in his book entitled The Tibetan Book of Living and Dying. This book has led to new perspectives in the quest to understand life and death, and has gained widespread acclaim internationally. Phra Paisal Visalo was influenced by this book and helped to translateThe Tibetan Book of Living and Dyinginto Thai, split into two volumes. The influence of this book has subsequently permeated Thai society both in terms of knowledge generation and as an inspiration to activism, leading to the push for improvements in palliative care and helping patients cope with dying peacefully. It is a great occasion that we can welcome Sogyal Rinpoche to Thailand in December 2015 on the invitation of Ajan Sulak Sivaraksa and the Sathirakoses-Nagapradipa Foundation (SNF). 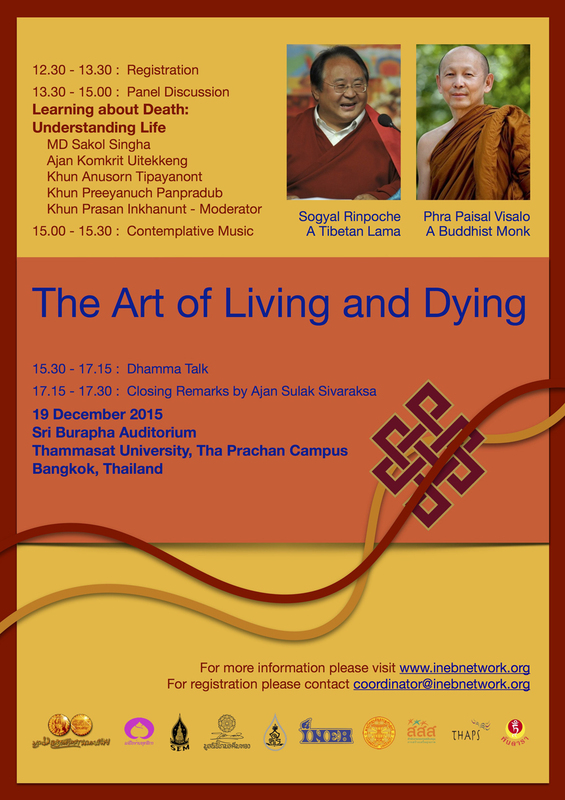 Rinpoche has kindly allowed for time to organize this activity to raise awareness and understanding of the nature of living and dying. SNF along with co-organizers including Buddhika Network and Komol Keemthong Foundation are honored to be able to organize this talk by Sogyal Rinpoche on “The Art of Living and Dying” and related activities. 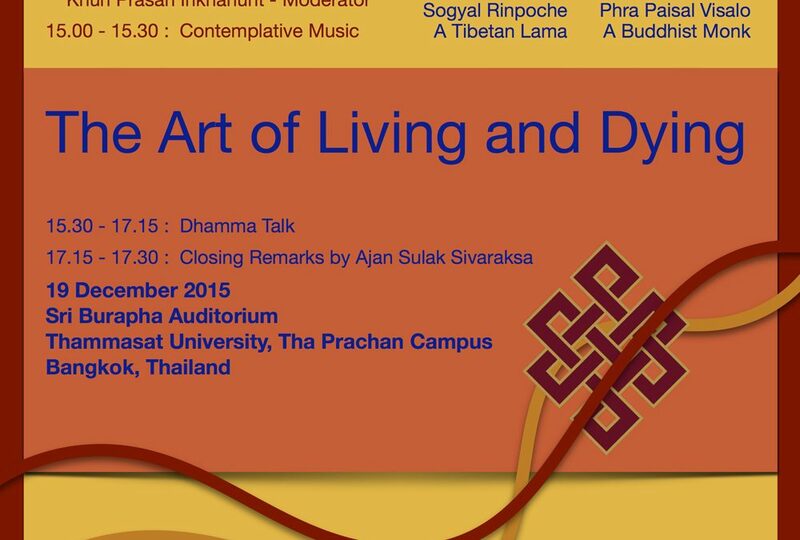 This event is scheduled to take place on Saturday 19 December 2015 at Sri Burapha Auditorium, Thammasat University (Tha Prachan Campus). The intention is that this event will help to awaken our society’s quest to understand the nature of life. A deep understanding of life is a key factor in maintaining true happiness in both sickness and health, a happiness that will in turn germinate the seeds of beauty and compassion in our lives and society at large.